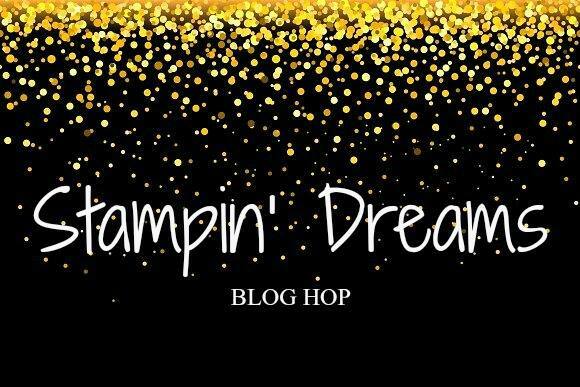 Welcome to the May, 2018 Stampin' Dreams Blog Hop. You are currently visiting Karen Farquhar from Australia and this month's theme is 'New Catalogue Sneak Peak'. I hope you are inspired by my projects today. Anxious to see what all the other stampers have created using the beautiful new products soon to be released in the 2018-2019 Annual Stampin' Up! catalogue I have really been looking forward to this Sneak Peek Blog Hop. One of the great things about being a Stampin' Up! demonstrator is you get to view the catalogue ahead of time and you are able to place a preorder. I have chosen the fun bundle Sea of Textures for my projects today. The images reminded me of the things you would see if you were looking through the glass of an aquarium so I have created a window card with a sea view. I really liked the sentiment 'thanks for reaching out' so I had to use it with the octopus image on the inside of the card. While doing a 'Spring Clean' of my craft room I found some little shell and sand shaker frames. I thought one decorated with some images from the Sea of Textures stamp set would make an ideal gift for my aquarium crazy grandson. Thank you for being part of Stampin' Dreams Blog Hop I recommend following the links below for more inspiration. I can't wait to see everyone else's creations. All stamp images © 1990-Current Stampin' Up! All content including text, photographs and graphics © 2007-Current Karen Farquhar. The content of this blog is the sole responsibility of Karen Farquhar - Independent Stampin' Up! Demonstrator and the use of and content of the classes, services, or products offered are not endorsed by Stampin' Up! Thank you.